Posted on Wednesday, April 2nd, 2014 at 8:28 pm. We Olive was founded on the idea that the small olive growers in California deserved a platform to share their high-quality, low-yield extra virgin olive oil that by nature cannot compete with the pricing of its mass produced (and often adulterated) grocery store cousin. Many of those small farmers employ sustainable practices, farm organically and contribute to the rich tradition of farming in their communities. As we grow larger as an organization, we remain committed to not only supporting small farms at a local level but to finding ways to adopt earth-friendly practices. 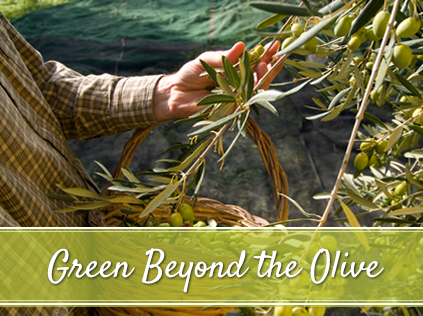 Here’s what we are doing now to support sustainability at We Olive. We support the small farmer and artisan producer. This ethos applies both to our olive oil, vinegar and gourmet food offerings and our wine program at We Olive & Wine Bar. We love that there are still people in the world who work with the sole purpose of creating something that is the best. These are people that are doing what they do because they love it and because they want to share with us how delicious and perfect an olive or a grape or small batch of caramel can be. Yes, it’s an incredibly romantic notion, but we’ll take something that is made with purpose and care over something that is produced strictly for the bottom line. There’s integrity in the food and drink that we source and we are proud to champion the little guy. We encourage going local. As We Olive grows outside of our original Paso Robles location throughout the state of California and now into places like New York City and Austin, Texas, we want to stick to our local guns. No matter where we are, we work to develop relationships with locals. Whether it’s a small organic farm to source seasonal produce for our wine bar menu, a locally made craft beer or wine, an artisan cheese maker or a small batch condiment producer, we’re always trying to find the people that contribute to the food culture of a region. We re-use with our refillable bottle program. If you’ve been to a We Olive store, you know the joys of tasting all kinds of EVOO and balsamic vinegar straight from the fustino. The bottles you purchased and had filled in our store can be re-sued and refilled over and over again. Even better, you can bring any clean bottle in for a fill and save both the cost and the landfill real estate or recycling energy expended simply by re-using. True story: Patrons of our wine bars have been known to have their just-consumed bottle of Syrah sanitized in store and filled with Aged Balsamic Vinegar to go! We support a seasonal, plant-heavy diet. You can’t be in love with olive oil without getting hooked on the health benefits of EVOO. It’s actually difficult not to eat for wellness when you begin to see the connection between olive oil and fresh, seasonal vegetables and your health. While we love a prime dry-aged ribeye, we embrace a plant-centric diet that is sourced locally and has a lower carbon footprint than the average American diet. We drink to sustainability. Visit a We Olive & Wine Bar and you will find that many of the wines in our program are not only made in small case quantities but employ sustainable practices. Whether it’s the mindful farming approach (100% organic and solar-powered) adopted by Medlock Ames in Alexander Valley or the Gruner Veltliner sourced from the SIP (Sustainable in Practice) Certified vineyard in Edna Valley.